Minimum vertical clearances for model trains have many implications when planning and building a layout. Of course, you'll need to make sure that all of your tunnel portals, signal bridges, structures, and other overhead obstructions are high enough. If your plans call for an over-under track arrangement like a figure "8," helix, or multi-level layout, then the minimum vertical clearance will also impact your grades as trains climb between levels. Consider the vertical climb needed along with the maximum grade when planning your layout. Obviously, different scale trains will have different minimum requirements for all clearances. In addition to the scale, the prototype of the model also has a big impact. Trains have been growing since their inception. Early railroad builders could not have imagined that trains would one day stand as tall as a modern double-stack car. Nor did they build their railroads to accommodate them. Since the 1980s, railroads have invested millions of dollars in clearance improvements to accommodate these or other large cars. If you model an earlier era or smaller trains like narrow gauge or industrial railroads, not only do your trains not need as much clearance as contemporary prototype models, they may look better with tighter spacing. On the other hand, oversize loads have always been a part of railroad operations. These unique cars, loads, and trains are fun modeling projects. If you think you'll be including any on your layout, plan accordingly. No matter what your scale or modeling era, a safe practice is to build a test train of your tallest and longest equipment to move along as you build. This will check both vertical clearances as well as check parallel tracks and scenery for lateral clearance in curves. The National Model Railroad Association has standards and recommended practices for just about every aspect of the hobby, including clearances. The table below is based upon their recommendations. For more detailed information, see their Standard S-7. Remember, these are only recommendations and only the minimums...you may desire greater vertical clearances in some areas for scenic effect or for access to the trains. (Our fingers don't scale down.) Also, these figures do not take into account any additional height required for the roadbed and benchwork used to support your tracks. 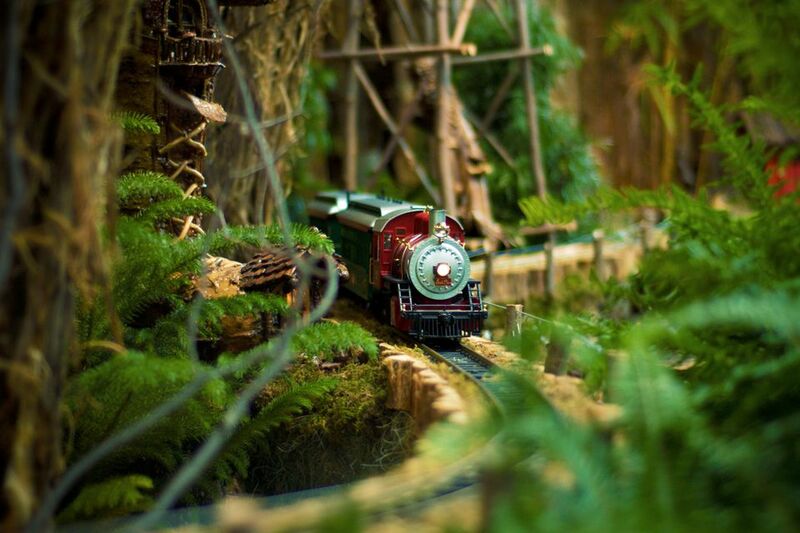 *Large scale trains include a variety of scales that all operate on the same gauge of track, commonly called G gauge. The scale of the models vary by manufacturer, hence the greater variation in these minimum requirements. Another option for those who desire the most accurate scene possible is to refer to engineering track charts for the railroad you model. These are relatively easy to come by online and through railroad museums and historical societies. You may even find drawings for major bridges and tunnels - your most likely modeling candidates. Keep in mind however that while our trains are usually close to exact scale, the larger rails, tighter curves and even the ride height of our models is frequently compromised and this can impact clearances around the trains as well.